Being an aspiring local traveler who would refuse a proposed all-expense paid trip to the 10th largest island in the country, BOHOL. Yes, I would have gone there before if not for a tragic situation that occurred in our family in 2009. It has been my dream to set foot into this marvelous, nature-rich island and discover Bohol’s popular attractions myself. Could it be true that opportunity only knock once? But I’ve got no regrets. I’d rather believe that things that are meant to happen will happen, regardless. I believe though that my brother is much luckier than me. Let the image below be the proof. He just uploaded it along with tons of other photos on his Facebook page recently and yes I am given the authority to grab any of them because even if I knew he would take pictures (not excessively as I do though) I still really had to politely ask him to take as much as he can and promptly said yes without a single question asked. He knew why. LOL! 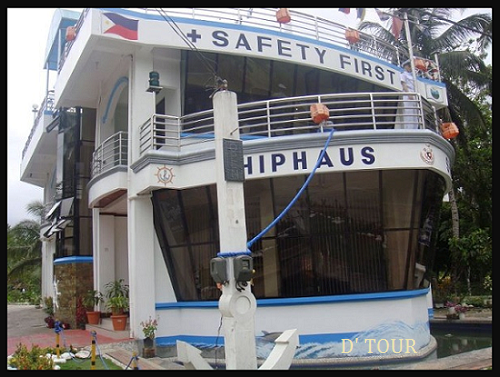 Anyway, the above photo is called the SHIP HAUS. I actually didn’t have an idea it exist in Bohol until I saw it was featured in a local Sunday TV show not so long ago being the new island’s attraction added next to the most popular Chocolate Hills, the Tarsier Conservation Area and the (oh the beach I am so dying to experience myself) Panglao Island. I don’t think they have gone there yet. More of the ShipHaus… I had to make a little research on this. Inspired by his profession and the successes behind it, the owner retired Capt. Gaundencio Dumapias - a native in Bohol who was once a poor man and later become a successful sailor built this house in the middle of the fishing and farming village in Batuan, Bohol. Initially the house was not intended for business but when done it draws so much irresistible attention – made him (the owner) decide to open the house to the viewing public later. And of course more than its amazing, a truly one of a kind structure, the ShipHaus is built to inspire other – young and old… that there is success when you pair hard work with constant determination.